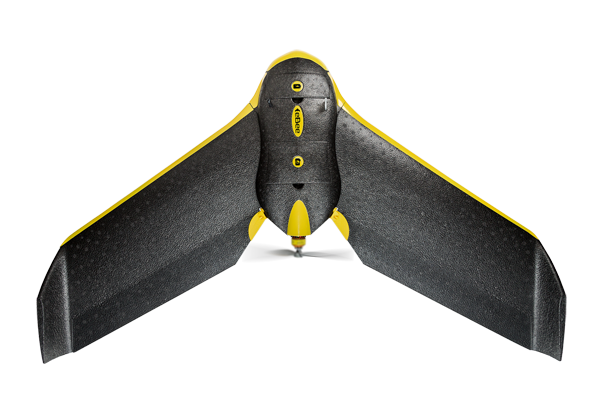 It is at the agricultural fair that Parrot will unveil a flying wing eBee of senseFly equipped with a multispectral photo sensor, the multiSPEC 4C, developed by the company Airinov on the recommendations of the National Institute of Agricultural Research. Aerial imagery by drone in the service of agriculture. "In the 1950s, civil aviation revolutionized agriculture. In the United States, the use of small planes and helicopters by farmers has quickly become very common. The drones are a natural evolution: much less expensive, truffled with sensors, precise thanks to the GPS and easy to program. Their adoption by farmers will be fast and I think that seeing drones over fields and vineyards will become a day as common as to see tractors, "says Henri Seydoux, founder and CEO of Parrot. Rapid to deploy, take-off alone, flying in formation below 150 m, GPS-guided and not very sensitive to clouds, the sensFly / Parrot professional drones can cover 10 hectares in just a few minutes with precision and resolution 20 Times higher than the satellite. Developed by Airinov, a French start-up specialized in aerial imagery for precision agriculture, and embedded on an eBee drone, the multispectral multiSPEC 4C photo sensor measures the reflectance, ie the amount of light reflected by The leaves, in order to obtain information on the state of photosynthesis. These observations are excellent agronomic indicators allowing, for example, to estimate the quantity of biomass or the nitrogen requirements. An agronomic interpretation for advocating nitrogen requirements. Indeed, once the eBee drone of senseFly / Parrot automatically returns to its take-off point, the images captured allow to realize a map of the characteristics of the cultures observed thanks to models developed by INRA. Key indicators such as the amount of biomass or foliar nitrogen content can then be estimated. These agronomic indicators are then converted into nitrogen recommendations to enable the farmer to optimize his inputs and to improve in quantity and quality the average yield of his crops. The centers of Versailles Grignon (78) and Toulouse Auzeville (31) of the National Institute of Agronomic Research will soon be equipped with the eBee drone of senseFly / Parrot for the follow-up of their experiments in the field. · Battery life: approx. 45 minutes. · Flight altitude: below 150 m.